Translated by Elisabeth Böhm and Ingrid Rothmann. The copyright of the translation is assigned for the year 1972 to the publisher. "Printed in Germany 1973" and "Ullstein Buch Nr. 2964" is stated on the copyright page. The last page of the final item (p. 138) is unnumbered. 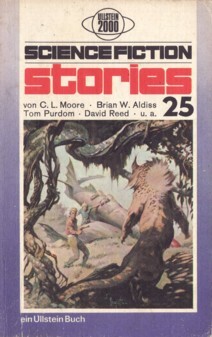 It's 'Science Fiction Stories' on the cover and the spine, but 'Science-Fiction Stories' on the title page (we acknowledge titles by denomination on title page). There's only an erroneous credit for the cover art (to the publisher Fawcett), but Frazetta's signature is clearly visible: it's the same artwork as for Beyond the Farthest Star.